THE ANCIENT AND ACCEPTED Scottish Rite of Freemasonry is more commonly known as The Scottish Rite. 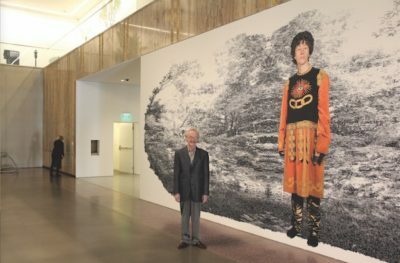 Recently visiting the new Marciano Art Foundation in the former Scottish Rite Cathedral in Windsor Square was R. Stephen Doan, who noted that the Marciano collection’s “Untitled #549-E” by Cindy Sherman, hanging in the building’s lobby, actually shows the artist with an Oddfellows, not Masonic, emblem on her bodice. R. Stephen Doan remains one of the most active Masons in California, if not the nation. A Southern California lawyer, Doan has been active in the movement since he was 14. A holder of the 33rd degree in the Scottish Rite, one of Doan’s many past leadership roles included overseeing the Scottish Rite Cathedral on Wilshire Blvd. in Windsor Square. 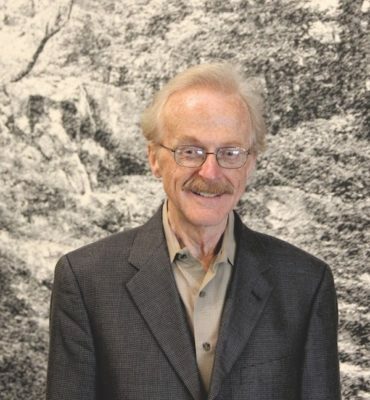 Doan and Larchmont Chronicle publisher and friend, John H. Welborne, toured the re-purposed building in January, and Doan — the former grand master of the Grand Lodge of California and venerable master of the Los Angeles Lodge of Perfection — offered his compliments for the re-working of the building by the Marciano Art Foundation and its designers, wHY Architecture. The historic building, fourstories high, maintains its exterior of Italian travertine marble, embellished with mosaics and gold lettering and adorned with eight, 15-foot statues. The interior is now a showplace for Maurice and Paul Marciano’s collection of contemporary art. To visit the new museum, see marcianoartfoundation.org.